Wondering What Beauty Treats to buy for Christmas? Sharon Nugent - Clinique Consultant. Gift: Clinique Happy & Smooth Gift Set contains a full size Fragrance & Body Smoother all for €30. Top Tip for Men: Try to find out what she likes from a friend or family member & Go to a store where you can ask for help in choosing the right beauty gift. What's Hot: Beautiful by Estée Lauder – always a Christmas Favourite! Value Gift: A three piece Double Wear Mascara Set in a Make up case all for €29. Top Tip: Shop at an official Estée Lauder outlet – you get all the special offers plus the complimentary Estée Lauder wrapping makes your gift look so much better. What's Hot: Chanel Number 5 – the worlds leading Fragrance. Top Tip: Personalise your gift by creating a bespoke beauty hamper. Whats Hot For Men: Chanel Allure Homme Sport. What's Hot: Visionnaire – Lancômes Advanced Skin Corrector. Every womans must have serum for Wrinkles, Pores and Evenness. Value Gift: All of Lancômes Christmas Sets are special offers – juicy Tubes sets start from just €22. What's Hot For Men: Armani Code Sport. What’s Hot: Shellac Nails – They look fantastic and last up to 14 days. Value Gift: The Nuxe range of skincare is very affordable and is ideal for making up hampers. 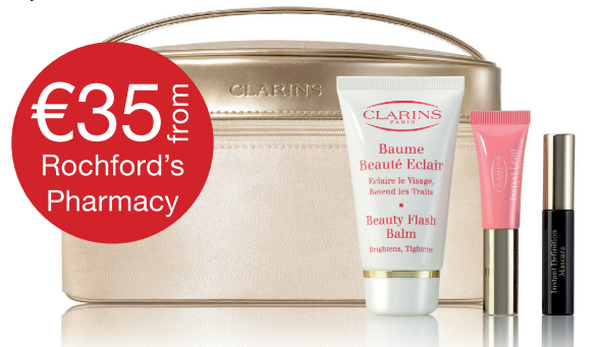 A Clarins Weekend bag containing products worth €45.47 including Clarins Beauty Flash Balm, Lip Perfector & Mascara.